NEW YORK (AP) — Nike is set to air a TV commercial Wednesday featuring Tiger Woods and the voice of his late father, an edgy move that calls out his personal problems on the eve of his return to competitive golf. The ad is to air on ESPN and the Golf Channel just one day before the Masters begins. In the stark, black-and-white ad, a solemn Woods looks directly into the camera without speaking while a recording of his late father is heard, speaking about taking responsibility. "Did you learn anything?" Earl Woods says. Woods is returning to golf after a leave that followed revelations of infidelities and a stint in rehab. The ad marks the first TV ad for Woods, who had been the face of many companies, since his problems surfaced in late November. Nike Inc. is one of the few sponsors to stand by Woods during his troubles. Woods is the face of the company's golf line and will be using its products when he plays in Augusta, Ga. on Thursday. "We support Tiger and his family. As he returns to competitive golf, the ad addresses his time away from the game using the powerful words of his father," Nike said in a statement. Nike typically doesn't shy away from mentioning athletes' troubles in its ads, experts say. The company has stuck by other athletes with personal problems, such as basketball star Charles Barkley, who famously said in one ad he shouldnt' be a role model. Other advertisers can get away with not mentioning their spokespeople's problems, but not when the athlete is this famous or when the scandal is so public, said John Sweeney, director of sports communication at the University of North Carolina at Chapel Hill's School of Journalism and Mass Communication. Some may question using Woods' father or mentioning the golfer's personal problems, but it makes sense from Nike's perspective. "You've stayed with the man, how do you re-engage?" Sweeney said. "It's not a question of what we would like to do under perfect circumstances, it's like we've stayed the course, he's back, how do we address it?" 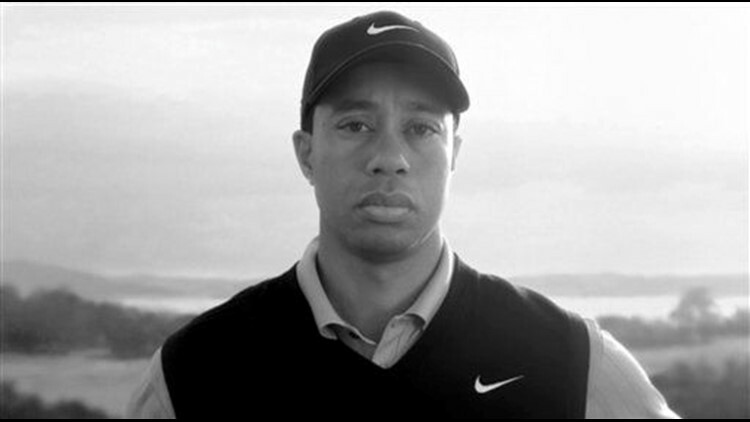 The ad also plays off Woods' prodigy aura by using his father, who is partly credited with Woods' early success. Woods has repeatedly said since re-emerging into public life that he strayed from the values instilled in him by his parents. "Tiger, I am more prone to be inquisitive to promote discussion. I want to find out what your thinking was. I want to find out what your feelings are, and did you learn anything?" the elder Woods is heard saying while his son looks solemnly into the camera. Nike, based in Beaverton, Ore., said the ad was created by Wieden+Kennedy, an advertising agency based in nearby Portland, that the company has partnered with for years. Woods had been the sports world's biggest moneymaker and was the first $1 billion earner. But he lost top endorsements from companies such as Accenture LLP and AT&T Inc. as the scandal unfolded. Other companies like Procter & Gamble Co.'s Gillette unit, didn't drop him outright, although it stopped featuring him in advertisements. But companies more closely linked to his golf ability, such as Nike, memorabilia maker Upper Deck Co. and video game maker Electronic Arts Inc. stuck by him. Experts say it will be a year or more before any major new companies sign Woods. Even then, it will depend on whether he can return to his winning ways. Skidmore contributed to this report from Portland, Ore.